Churchill Corporation manufactures a variety of standard hook and handle hardware products used in a wide array of avionics applications. 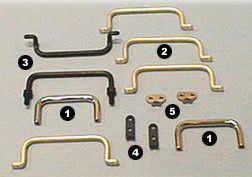 Handles – Nickel-plated brass (410 series). Handles – 110 series aluminum, gold chem filmed. Handles – Finished with black anodize. Hooks – Finished with black oxide. Max Loading Per Hooks Lbs.